A couple of manufacturers always outshines others with their desire to innovate something new and the will to act accordingly. Shimano shines bright like a diamond with their incredible fishing gears produced over the years. The best Shimano spinning reel is no exception. How many times inferior fishing equipment has let us down on a fishing trip? It’s mainly our fault that we fail to recognize the quality product. This article focuses on helping you determine the best Shimano spinning reel, so you won’t have to face another failed fishing trip! A good blank is the backbone of a spinning tackle. So you need the best saltwater spinning rods to compliment your best Shimano spinning reel. Our goal is to provide you with products that reflect reliable performance for a fraction of a price. Top review geek team has tested and researched these five Shimano spinning reels and came up with 2 ultimate choices. Best saltwater Spinning Reel- Shimano Thunnus Spinning reel is the best saltwater reel you can pick. It has a lot of nifty features. 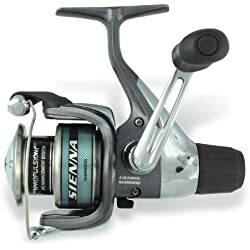 Best freshwater Spinning Reel- Shimano Stradic HG Spinning reel is the best freshwater reel you can pick. It also offers amazing features and sleek performance. Let’s get into the article and hope you find the desired Shimano spinning reel. One more thing, these reels are tagged with a high price, so I recommend you get a proper reel pouch and cleaning kit for long term top tier performance. Intro: Shimano has been in the game for a while. And time after time they produced reels which won the hearts of countless angler across the US. Introducing yet another amazing spinning reel named Thunnus. I know what you’re thinking, and yes, it is one badass villain like Thanos, but to those stubborn fishes only. And no, it won’t land you half of the Ocean’s fish with a single turn of the handle, rather hook one at a time. Now let’s jump into some details and see what kind of features the Thunnus packs in its arsenal. Reel Material: A reel that is lightweight yet powerful enough to battle some of the biggest gamefish is what every angler’s desire. Shimano understood that appeal and delivered it with their Thunnus series. Constructed from carbon fiber which helps the reel to be 20% more Lighter than graphite built. 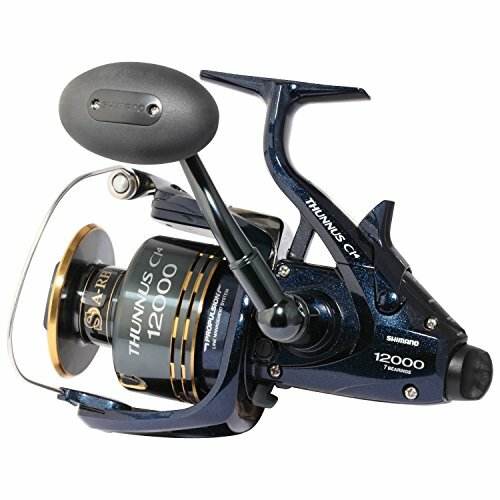 Weight: The Shimano Thunnus TY4000C14 weighs only 12.7 oz. The bulk isn’t noticeable at all after mounting it on a rod. I will praise Shimano for the balance it offers, especially when casting for longer distance. You can also take advantage of fishing for longer hours without any fatigue and cast more accurately thanks to the lightweight. The TY6000C14 also offer similar performance without the exception of more dragging power and 18 oz weight. Whereas the TU8000C14 weighs at 19.4 oz and the TU12000C14 is at 27.7 oz. Gear ratio: The first three models come with a low gear ratio of 4.8:1. The TU12000 has 4.4:1 so you get just enough firepower to battle those gamefish. Ideal for Deep Crankbaits, big swimbaits, and deep water spinnerbaits. The slow gear ratio is also perfect to present heavy bait to those big gamefish. A slower gear ratio means more torque and the Thunnus series doesn’t disappoint. The TY4000C14 series can reel in 30” line per turn whereas the TY6000C14 series can outperform with 35” lie per turn. The TU8000C14 can reel in 36” and the TU12000C14 can do 37” respectively. Ball bearings: All the models accommodate 6 Shielded A-RB ( anti-rust) ball bearings for smoother reel performance. The overall shielded design minimizes the amount of saltwater from entering in. That’s why those balls also stay shiny after years of saltwater abuse. Drag system: Thunnus comes with dual baitrunner drag system. Basically, it means you will have complete control over the drag. The 4000 model has Max drag of 15 lbs and the 6000 model can pull up to 20 lbs. The 8000 model do the same whereas the 12000 pulls a maximum of 27 lbs. Line capacity & overall statistics: One of the most important aspects of any reel. Line capacity and quality determine the reel’s overall performance and value. These 4 Shimano saltwater reels offer a different solution for specific fishing styles. Let’s get some insights below. This one is perfect for relatively smaller inshore species. It also packs enough line to keep up with those fishes who love to run away. Do you like small sharks? How about those large snooks or reds? If so then this is the reel for you. Perfect for landing medium sized inshore species. This one is excellent for group fishing and hunting down big saltwater gamefish. If you wanna really go out all on dragging an extra line capacity than this is the best choice for you. Now let’s see how each model fairs with each other in overall statistics. Special Features: The specialty of this blank starts from its build quality. Both the frame and rotor is made from CI4 carbon fiber which is 20% lighter than graphite. Shimano uses Paladin® Gears which is basically a combination of a solid brass pinion gear and a cold forged aluminum drive gear. It provides a smooth experience. It is even stronger than the stainless steel drive train. To ensure smooth casting, the Thunnus sports a Propulsion® Line Management System. The system accommodates a unique rolled lip design on the spool that ensures the line to flow smoothly off the spool. So the next time you go angling with this particular model, expect a less chance of wind know and backlash free experience. To prevent any wobbling in the rotor system, Shimano implemented a technology called the “Dyna-Balance®”. It fine-tunes each rotor and uses state of the art even balancing to eliminate any chance of rotor jiggling. We have a feature that has a mixed reaction from the angler community. It’s the Oversized Septon® Grips which gives a firm grip but tends to be sticky if you hold it for a long time. Shimano uses their very own Dartanium dual drag system on their Thunnus series. It matches the drag performance similar to the Baitrunner D series of reels which houses cross carbon drag system. These waterproof cross carbon washers wear out in time. But no worries mate, It is replaceable. Just make sure you get the right size. Thunnus lets you have the luxury of unlimited drag power thanks to the front & rear Baitrunner drag system. The front drag sits on top of the spool whereas the rear one is adjusted on the bottom of the reel. Wait there’s more. Thunnus gets equipped with the Super Stopper® II single-way roller bearing So you can get smooth hook set and enough fish stopping power. Reputation: You know what I’m about to write, and yes, the Thunnus gained a solid reputation thanks to the positive feedbacks. The Shimano Thunnus 4000 CI4 review indicates an overall positive overview as well as the rest of the models. With a total of 87% satisfied customers, it’s no wonder Shimano is the top of their game. Overall: First of all, the immense price tag makes you wonder whether the Thunnus is the best Shimano saltwater spinning reels or not. Let me give you a hint. I’ve been using this reel for over 14 months without even a minor hiccup. I guess you have your answer. Intro: Yet another masterpiece from Shimano. This time they manufactured a reel that rules the freshwater realm with all its features and smooth performance. Introduction the king of the freshwater reel the Shimano Stradic HG. Yes, it may cost a few dollars more but outperforms any rival reel with ease. Let us find out why the angling community shows high praise for this particular spinning reel. 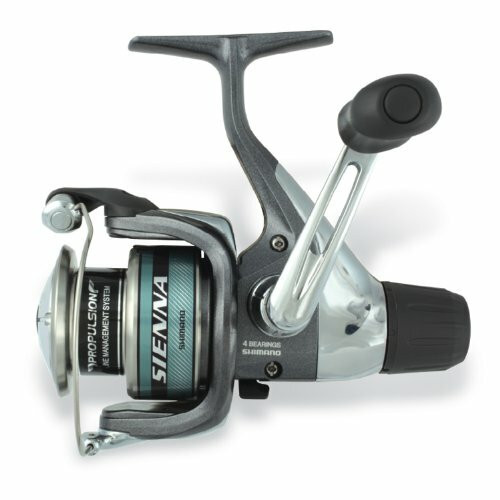 Reel Material: The reel is made from Shimano’s very own G-free Hagane technology. Gearing of this series is also cold forged from Hagane technology. 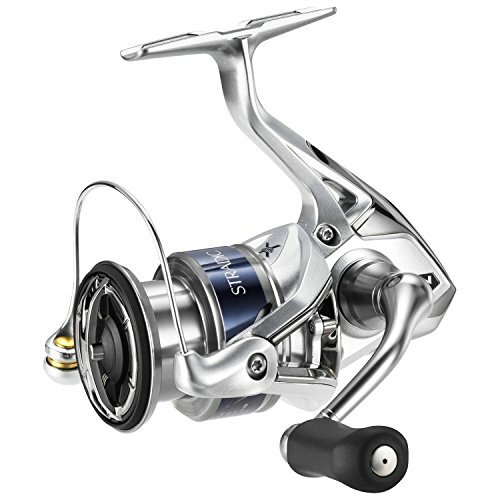 It boasts the reel’s body with durability and ensures optimal gearing performance. Weight & Size: Shimano freshwater spinning reels are lightweight and durable. But these Stradic series has taken the meaning of lightweight to a whole nother level. Ranging from 6.9 oz and all the way up to 11.3 oz, all those 5 models are ultralightweight in comparison with other rival reels in the market. Gear ratio: The gear ratio of a reel determines the advantage in specific fishing style. Now let’s find out how each model stacks up specific fishing style. Medium gear ratio reels can perform multiple techniques. That’s why it is very popular with bass anglers. If you are casting through the grim cover with a squarebill upon the respawn or burning spinnerbaits over the shallow flats in the fall. These styles are perfect with a medium gear ratio reel. If you are looking for a reaction strike then 6.4:1 ratio works best. That extra burst of speed forces the most aggressive fish to react hence makes it easier for you to fish the bait quickly. The 6.1:1 ratio acts a little elegantly. The less speed allows the bait to be in the striking zone for a little longer. Yet offers enough speed to get a reaction strike and allowing added torque. This style works well if you’re fishing crankbaits that races off in 8-14 foot range. Ball bearings: All the models are equipped with 6-pieces of ball bearings. Ball bearings let the reel perform smoothly and more efficiently. But remember, ball bearings need to be both better in quality and also in quantity. Thankfully they used S A-RB bearings that is durable. One thing they avoided was the convenience of anti rusting. From a business point of view, it’s understandable. Since its a freshwater reel and all. Drag system: The drag system is one of the most important parts of a well balanced spinning reel. The Shimano Stradic HG FK series sport only a front drag system, allowing the reel to drag from 7 lbs up to 24 lbs. Which is quite enough for the freshwater expedition. Line capacity & overall statistics: Another important aspect of a spinning reel is how many lines it can be integrated with. Now let’s see how each model grants you advantages in specific fishing techniques. This particular model is good for shallow crankbaits. This reel harness enough power to drag the baits around the water. You will get enough speed to retrieve and re-cast right away. Deep crankbaits is also possible with this reel’s 6.0:1 gear ratio. The reel will provide enough torque to drag these baits. So, the bottom line is, if you like catching large fish like summer bass, or any kind of bass, this one should fit your preference. This model operates similarly as the ST1000HGFK with the exception of higher line capacity. This one is also the same as those previous two models. It varies in max drag, line capacity and line retrieving rate. A little heavier in comparison to those previous model but has more drag power, line retrieving and capacity. And you can use jerk baits and spinnerbaits with this model. The Shimano Stradic ST5000XGFK: Massive drag power and line capacity, this reel can be used for jerk baits, spinnerbaits, shallow crankbaits, and even deep Crankbaits if you persevere. Special Features: Shimano Stradic series comes with a few unique features. Now, these aren’t just fancy tweaks my friend. You will actually benefit from them in the real application. Now let’s see. You already know the reel’s body has Metal Hagane construction. But what does it do? Well, the biggest problem of a reel’s stability is flexing. Especially when the line gets stretched by those monsters. The is specifical metal prevents such flex and thus making the reel stable and sturdy. Not only that my friend. You will also get too class rigidity and proper cranking g power optimization. It’s like the body has an ongoing adaptability program. Now let’s focus on the main gear section which is also a cold-forged Hagane with integrated X-Ship gear system. The system elevates strength and enhances bearing support which increases the reel’s overall smoothness and optimal power transmission. Castaway, near or far, wherever you desire! Oooo and splash! How many times the rain playfully spray its water over us. Now it’s all good and fun until you realize, what about my phone? Or did water sneak in my best freshwater spinning reel! With the Stradic series, it won’t matter much. The 12 different seals will keep the water out of the mechanism. Shimano even went ahead and applied protective coating so the water slides off the reel’s body rather than bead up. Wait, what? There’s more? Yep. I still haven’t discussed how the built-in Dyna-Balance rotor. This special rotor enhances the overall smoothness of the reel even more so you end up experiencing something memorable. The Shimano Stradic HGFK also features fluidrive || system that helps you to cast the line even further with increased accuracy. No matter how optimal a reel perform, it won’t create appeal in anglers if the line gets tangled or get messed up in the spool on retrieving. Shimano knew this and brought us a solution called Propulsion line management system. It checks the line for any tangle and prevents it from messing up in the spool. So you can get a nice disciplined line alignment to end the day on a positive note. You can also fish for longer without any fatigue. Thanks to those soft touch knobs. I really like the approach of Shimano towards customer-friendly marketing. I personally give my gratitude for providing us a reel cover. It may not be a big of a deal, but it shows the positive and consumer-friendly mentality from Shimano. Great job guys. Reputation: How do I put this simply? The Stradic series are the best Shimano freshwater spinning reels. And I have the stats to prove it of course. With 86% positive customer feedbacks, you don’t need to think twice about this one. Apart from a few isolated incidents like bail problem, gear noise, and defective drag system, it’s all looking great for the Shimano Stradic series. You can easily take care of these above problems to Shimano spinning reel repair. Again, those problems were faced by 4-5 people so don’t worry, grab one and hook some bass. Overall: What can I say? This is the best Shimano spinning reel for freshwater. For better longevity, apply some tips for proper Shimano spinning reel maintenance. Just check below the article for further details. 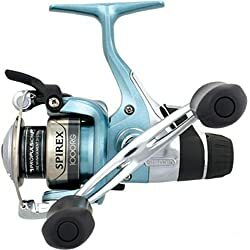 Intro: I will come straight to the point here guys, the Shimano Spirex RG fishing reel is focused on easier handling and ergonomic experience. It’s like a well-balanced Katana for you to slash up those small and medium-sized trout, walleye, bass etc. Reel material: Now, first of all, this ain’t an ultralight option for you. Especially in contrast to Thunnus or HG series. Its because the reel is graphite constructed. The rotor and spool are forged with the same material. Now it might not so sleek as a carbon fiber construction, but the affordable price tag does put a smile on my face. Weight: Which brought us in this section. The Shimano Spirex RG offers three models to choose from. Don’t worry guys, it ain’t that heavy after all. Ranging from 10-15 pounds, you’re getting a lightweight option with a bargain price. Gear ratio: Gear ratio helps determine the kind of fishing you actually can do the best. Now let’s see how each model stacks up with on each other. This one got the same gear ratio as the previous model. Although offers higher line capacity and more drag power. That means you can hook in slightly bigger fish. This one got a slow action gear ratio, rated at 5.7:1. So you can do deep water spinnerbaits, deep crankbaits and big swimbaits with this reel. Ball bearings: I probably forgot to mention that this reel is a saltwater one. But here’s the advantage, you can use it for freshwater angling if you want. Now, where are we? Oh yeah, the balls. I mean the reel’s balls of course. Well, it’s all good and shiny. Shielded stainless steel makes them corrosion resistant and durable. Drag System: It’s nice to have some stopping power at any anglers disposal. The Shimano Spirex series doesn’t disappoint there. I mean the very name of the series indicates a rare gear spinning reel. In short, RG. Also, the fighting drag system makes the on-the-fly-drag adjustment much easier to perform. Line capacity & overall statistics: The Shimano Spirex series reels are compatible with Mono and power prolines. Let’s look at the overview statistics for more distinctive information on each reel. 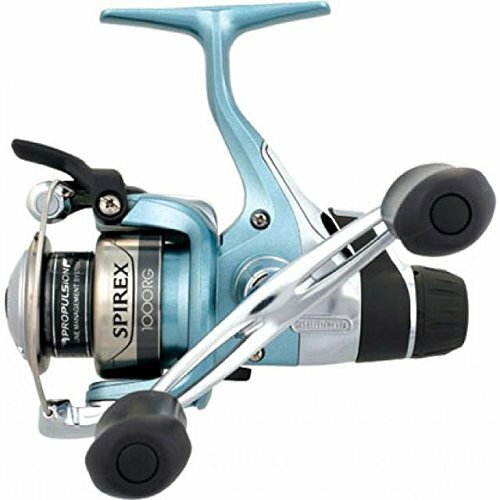 Special features: The Spirex series may not pull heavy prizes out of the water but boy oh boy did Shimano packed it with a lot of features. Now let’s find out how each feature behaves in real life utilization. Let’s start with the S A-RB bearings. It operates similarly as Shimano’s very own A-RB bearings. But that shielded protection on both sides decreases the chance of salt, sand and other dust particles from building up in the rotation of the bearings. The spool of these reels is built with CF Aluminum Cold Forged Spool. The process makes these spools powerful and tougher than any regular diecast aluminum or graphite spools. Alright, now let’s see what Dyna-Balance is helping us with. Basically, I mean the system, prevent the rotor from wobbling during the retrieve. It uses computer data to process optimal balance just like the tire of a car. Shimano was able to redistribute the rotor weight so we can enjoy the sensitivity and smoothness of the Spirex reels. Shimano features the new Propulsion spool lip design. It allows the propulsion line management system to function properly. After thousands of thorough casting tests and computer simulations to make sure the new spool lip design not only retrieve line accordingly back to the spool but also ensures longer casting distances than an average spool lip design. It also prevents backlashes and forming of knots in the line. To increase the efficiency of the line retrieval, Spirex implemented fluidrive || which features an oversized master gear polished applying a wrapping process. I told you before, these reels are like blades. Well, the Quickfire || feature certainly proves my remark. For one-handed casts, the line and trigger automatically centered itself so you can reach it using your index finger. Shimano altered the speed of oscillation cam by installing an oval oscillation gear. The non-stop rotation of a standard oscillating gear results in uncertain spool velocity when redirected to the cam. But the varispeed oscillation provides consistent speed to the cam which creates an even line lay, convenient for an accurate cast and organized the fishing line. Reputation: The positive customer feedback proceeds the success of the Spirex series in angling g community. With 84% satisfied customer to account for, it certainly won’t cause any trouble when you start using one. Only a few people expressed the bail doesn’t disengage the line, especially when the bait hits the water. But my daughter is using this one for two and a half months now, never faced any issues. I’m pretty sure these are some isolated manufacturing faults, which are repairable by all means. Overall: Folks, I will make my statement clear again, if you like to fish walleye, small mouths, and other average sized species, I absolutely recommend this one. I use this one as supporting fishing set up, especially when I need to have a delicious meal. Intro: I will praise Shimano for allowing a budget angler to taste some o it’s latest features. The Shimano Sienna spinning reel comes with some incredible advantages. Also rocking an affordable price tag, this one is truly the best Shimano spinning reel under 100$. Reel material: Without proper construction, no product can perform efficiently. Not only you need positive feedback, but also in a competitive price tag. Luckily Shimano did just that with their much-anticipated sienna series. The reel frame, side plate, and the rotor are made from pure graphite. Not only graphite as a material is easier to use but also reduce production cost. To allow a more distinctive look, Shimano designed the Sienna with M-Compact XGT-7 material. Weight: A lighter weight reel offers comfort and ergonomic advantage during a long fishing session. When it’s come to lighter weight, the Sienna series is on par with other rival products. You will get two models. The Ultralight weighs in at 8.3 pounds and the Heavy RD weight in at 13 ounces. Gear ratio: This is the section where it will be determined on which fishing style you’re gonna get some advantages. This one got a slow gear ratio rated at 5.1:1. For better result, you can do deep water spinnerbaits, deep crankbaits and big swimbaits with this reel. This one has a 5.2:1 slower gear ratio with differences in line capacity, drag power, price, and other stuff. You can do a similar fishing style like I’ve mentioned already in the RD model. With the exception of the ability to hook bigger fish of course. Ball bearings: The Shimano Sienna is suitable for both freshwater and saltwater application. Shimano managed to accommodate 3 stainless steel ball bearing and 1 roller bearing for instant fish stopping power. Drag: The RD model has 12 lb drag and the ultralight model has 7 lbs of drag. Now I know it may not be at par with top tier spinning reels from Shimano but considering from the price point of view, I would say it’s acceptable. Besides you still can land some sizable fishes if you play it smart. Line capacity & overall statistic: In this part, we will look into detailed statistics of the Sienna FE series. Line capacity, compatibility, and others. Special features: Did you think Shimano didn’t put any tweaks and features in their Sienna series? Well, you’re wrong. They integrated enough features to make your jaw drop in shock. Let’s track them down one by one, shall we? The Sienna series have a front drag system. I saw a couple of large drag washers when the first time I opened this one for a thorough cleaning. A front drag system may be a little difficult to execute In comparison with the rear drag but it offers more dragging performance and durability. Basically, this front drag system can sustain more backlashes from a fighting fish than the rear drag. I’m surprised to see the patented AR-C spool design with a V-shaped spool lip. To put it in a more simpler way, the line comes off the reel in smaller loops resulting in a more accurate and distant cast. The spool also helps reduce backlashes. Now it brings us to the famous Dyna-Balance feature. Basically, this particular system helps to balance the rotor upon retrieving by using computer data balance analysis. It redirects the rotor weight so you can enjoy enhanced sensitivity and smoothness. I’m sure we all faced the line twisting situation for rapid casting. What if I tell you Shimano solved this problem? Are you excited to find out? They simply put a system called Power roller which is also known as the line twist reduction system. It’s unique trenched design allows the line to stay organized in the spool and prevent any unwanted loops and tangles during the cast. It’s nice to pack some fish stopping power at disposal. The Super Stopper || provides just that. With a single roller bearing, you can perform instant anti-reverse whenever it’s necessary. I’m kinda surprised to see varispeed oscillation option on the Sienna FE series. Unlike the standard oscillation system, which involves constant rotation of the oscillation gear that results in inconsistent spool speed when redirected to the cam. With this system, you run the risk of line stack up at either end of the spool. Shimano solved this uncertain outcome with the installation of an oval oscillation gear system. With consistent spool speed and even line layout, you can have the privilege to an accurate castability and organized line management. Reputation: Shimano spinning reel reviews always reflect a positive vibe. With the Shimano Sienna spinning reel review, it’s no difference. With a total of 80% satisfied customer feedbacks, it’s no wonder the angling community thinks highly the best Shimano spinning reel under 100$. Overall: It’s far from being a top-notch performer but at the end of the day, gets the job done. And considering the price point of view, it’s worth a go. The Sienna series is undoubtedly an excellent choice for any beginner angler. Intro: Shimano has done it again guys. They gave us a premium freshwater option with the Stradic series, and now we have a budget option. Introducing the budget-friendly Shimano Syncopate Front drag freshwater spinning reel. And Shimano hasn’t shied away from giving essential features to the Syncopate. Let’s get some details below. 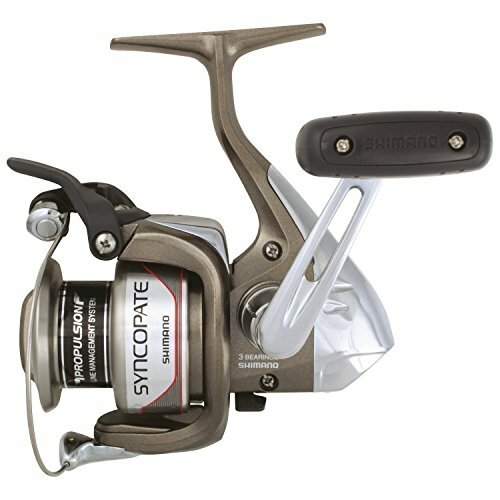 Reel material: To stay in the competitive pricing game, Shimano constructed the Syncopate frame, rotor and side plate in graphite. As well all know by now, graphite is both cheap and lightweight component. And also easy to give shapes as you see fit. Weight: Since it is graphite built, you can expect a comfortable and lightweight feel. And Syncopate series delivers. All three models have different weights. The SC1000FG weigh in at a mere 7.6 ounces. On the other hand, the SC2500FG stands a bit heavier at 9.2 ounces. Last but not least, the SC4000FG weighs at an exact 12.7 ounces. Gear ratio: Gear ratio determines a reel’s ability to perform specific fishing style more efficiently. Now let’s see what each model packs. This particular model features a slow gear ratio. As those other models do too. Rated at 5.2:1, you can do deep water spinnerbaits, deep crankbaits and big swimbaits with this sleek little bugger. Now this one is also a slow gear ratio. Rated at 5.2:1, same as the SC1000FG. You can do similar baiting with the exception of more line and drag capacity. The slow action gear ratio of 5.1:1. Excellent for deep water crankbaits. Ball bearings: All three models have 4 ball bearings and a single reverse bearing. The quality of the ball bearings offers smooth performance and stable reel mechanics. Drag: A perfect drag helps the reel to withstand the overwhelming backlash of a hooked fish. So a good reel should possess the quality of adequate drag power. The SC1000FG & SC2500FG both have a maximum of 7 lbs drag power which is enough for a medium-sized catch. Whereas the SC4000FG offers a Max drag of 13 lbs. So you can fight with some wild striped bass, rainbow trout or smallmouths. Line: Line capacity varies with each model. A heavy line means you will have a better chance of landing a sizable fish without breaking the line, spool or the tip of the rod. Special features: Special features, with this price tag? Yes folks, Shimano kinda killed the competition by putting in a few nifty features in their Syncopate series. Let’s check them out, shall we? I can’t believe they put Dyna-Balance with this lineup. The system prevents any wobbling of the rotor during the retrieve by balancing out the redirected power. How many Y’all get annoyed with twisted lines from time to time. With the power roller line twist reduction system, you can expect a 50% reduction of this mess. That brings us to the Propulsion Line Management System. It’s the standard component of the all-new Propulsion spool lip design. This system went through thousands of test and computer simulations before integrating to the spool. But when Shimano successfully embed the system with the spool, longer accurate casting and backlash reduction made possible by the Syncopate reel. Wanna swing and cast with one hand? Yes, it’s possible with Quickfire ||. The system helps the line and trigger self-centered and are close to the angler’s index finger for easier access. The standard oscillating system causes constant rotation of the oscillating gear resulting in inconsistent spool velocity when redirected to the cam. This could often cause the line lay to stack up either end of the spool. But the introduction of the oval gear, the oscillation cam speed gets altered thus making the speed of the spool consistent. The system also enhances accurate castability and organized line I the spool. Reputation: The Shimano Syncopate gained popularity among anglers over the years. And it has the rating to show for. With 87% consumer satisfaction rating, any angler will step back and have a closer look at this budget beauty. Apart from a couple of isolated manufacturing defects, the reel maintained it’s pristine reputation throughout the years. Overall: This one is a nice freshwater budget solution for those new and enthusiastic anglers. But I think an avid angler should keep this one as a secondary option for their tackle box. This single act can determine the longevity of your reel. I’ve seen some of my closest folks abuse their 300$ reel thinking it can sustain. But in the end, it didn’t. On the other hand, I’ve watched my cousin using roughly 70 bucks with of Abu Garcia season after season. Do you know why the cheaper one Outlast the better one? Maintenance. No matter how well built and expensive you’re reel is, you have to take care of it from time to time. It’s just that simple. Now come along, let’s gather some tips on Shimano spinning reel maintenance. There are a lot of small yet complex parts can be found in a spinning reel. If you decide to do more than oiling and greasing, I suggest you keep that equipment in separate boxes. One missing parts can spell catastrophe for the reel. No no, don’t reach for WD-40. Not every problem in the world can be solved with that liquid. Instead, use a proper reel cleaning kit for the best outcome and longevity of your hard earned investment. Avoid handle reel parts on a metal surface. But if you don’t have a choice then use a cotton sheet as the surface cover. Any sort bending, scratching and other structural damage might disable your reel, permanently. So e of you might disagree on this but trust me. It’s better to spend a few moments unreeling the line rather than mangle within the reel mechanism. But if you insist on taking the risk then use sticky tape to secure the line. Are you greasing the spool starting from the top? If yes, then stop. This will make the grease not stick properly within the gears and also make a huge mess. Instead from the top, start working your way from the bottom teeth. This simple turn over will help lubricate your gears property. Corrode and rust can make it hard for Shimano spinning reel repair. If you use your reel mostly in Saltwater then after every fishing session, rinse your rod and reel thoroughly in the freshwater. It will extract excess salt and other particles off your spinning reel and increase longevity. How are you storing your spinning reel? I bet it’s a card box, or just letting it sit naked in the garage! Get one thing straight, moisture damage and rusts even if it’s the best saltwater spinning reel for the money. To prevent such demise, store them rods and reels in a flannel bag. Some reels come with a cover provided by the just like you get a few model offering Shimano spinning reel cover with the reel. These bags absorb the moisture from the reel and keep it in pristine condition for the upcoming fishing season. Reset the drag of the reel before storing for the offseason to prevent unnecessary stress. Cut off any remaining line. Lubricant all the moving parts. If you don’t have a rod storage bag, then it is recommended to remove the reel off the pole and store them separately to avoid jamming and any other damage. If my tips aren’t enough to feed your curiosity then read how to clean fishing reels and hopefully, you will get what you seek. 1. Why can't I feel now drag pressure? This annoying issue is the cause of line slippage. To know if you have line slippage or not, you need to use braided line. Simply tighten up the drag settings the maximum, and hold the line firmly with your forefinger and thumb. Now start to crank the handle and if it rotates while the line stays still, you got line slippage. Now you know how to diagnose, but what about the solution? It’s easy, just get two layers of monofilament and join them on the braided line. Also wrapping up two layers of masking tape around the spool arbor ensures proper grip and prevent any further slippage of the braided line. 2. Why the bails not closing properly on my Shimano Reel? Proper bait engagement and disengagement is crucial for line leaving off the spool. There are three possible causes for this malfunction. There might be a weak bail trip spring. I would recommend replacing it rather than making an attempt to repair. Observe the bail wire for any physical damage, like bending or wearing out of shape. Just replace it. You got some rusting and corrosion on bail pivot. Try to reverse the rusting process by cleaning the corrosion and apply oil to the pivot. 3. Is there any way to prevent or avoid line twist? Yeah, that would be a dream come true. I don’t know if there is any tech that guarantees zero line twist. But there are some tricks to reduce the chance. Now let’s find out why does this happen in the first place. Maybe you’re using for a long time. Or Maybe the shaft of the lure isn’t straight. Basically when the lure instead of the blade spins in the water during reeling in the line and casting. Enough with the line twisting reasons, let’s talk solutions. And the best solution is, wait for it… Replace the old line with new ones. Oh God, I hope you don’t hate me now. Let me make it up for you. Here, let me help you find the best monofilament fishing line. 4. Why does my reel make grinding noise upon retrieving? There’s not a single angler on this Earth who haven’t faced this problem. There are mainly two reasons for this. Your reel gears are not properly cleaned or lubricated. Sometimes Rusty bearing parts can make annoying grinding noise and vibrations. Long term use can also cause the sound to appear suddenly. Just lubricate your gears by using the right gearing oil. Don’t use grease cause it may disrupt the smoothness and make the bearings sticky. Maybe your gear strip is damaged. It’s possible to find a replacement and it might not be an issue if you have a manufacturer warranty. But still, if you can’t make up your mind then let my good buddy Dave take a look. 5. How to cast with my best Shimano spinning reel for trout? We all had fun while casting in the stream or lake over and over again at the same spot. Trust me, it won’t help you hook a trout even if you have the best Shimano spinning reel for trout at your disposal. Use the method called “fan-casting”. Basically by letting the lure cover more water surface. It’s a matter of having absolute control over your lure movement. Slow action gear ratio works, particularly with trout hunting. For over 40 years, Shimano has dominated the fishing game with their exceptional gears. It was tough to choose the best Shimano spinning reel because every product from Shimano is a masterpiece. Before I sign off, j would suggest you take good care of your reel for smoother and long lasting performance. I put a few tips as simply as I could in the maintenance sectitabove so you can take care of some minor malfunction. There you have it, folks. Have an amazing angling experience with premium quality gears. Yes, it costs a fortune. But you can’t put a price on your passion.